This has been the most glorious Autumn day. 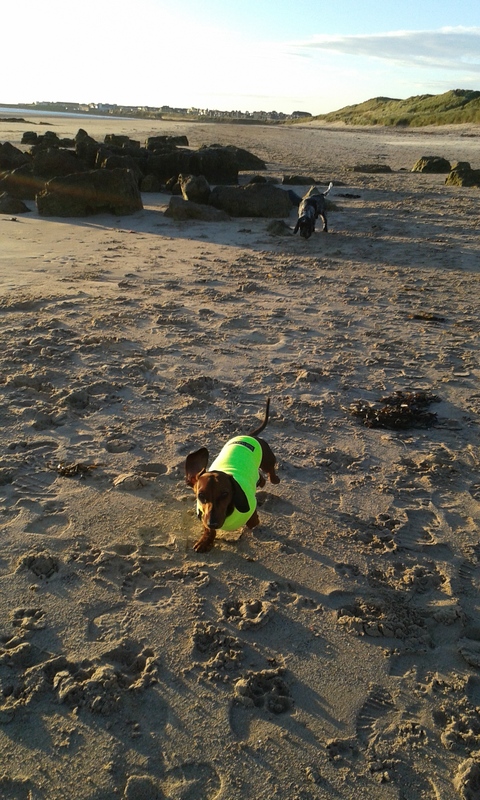 On the beach this morning, a brilliant sunrise was enhanced further by the garish jerkin my tiny sausage friend was wearing for the first time. Designed to make his whereabouts unmistakable in the murky mornings to come, today he became a veritable daffodil springing up behind this rock and that on the deserted beach. On morning runs, young Nico follows my lead with unerring dedication: on such exploratory missions, we are collaborators, that’s for sure, and this morning I treated him to a real bun fight, with lots of growling and rolling about. Once we get home, though, it’s another matter, and the sunny sausage cleaves to our biggest brother, Newman, who can do no wrong in the little dachshund’s eyes. Despite the glory of the weather first thing, Uncle Newman seemed distracted this morning; more than usually self-absorbed and more than usually oblivious to both direction and correction. He had to stay with Kemo Sabe for nearly all of the run, unable to stay off the seaweed for more than a moment whenever released from the lead; what has got into him? NuNu is the sweetest golden bear: a kind of overgrown school-boy, to speak true, but also gentle and patient, especially with ‘the little fellow’. He wants more than anything to love and be loved. In this he takes after Uncle Wilkins, who was one of the Old Guard, apparently always away with the fairies and, when having an epileptic episode, on an entirely different plane all together. I know that Kemo Sabe wonders whether NuNu also has more than a touch of Prince Myshkin about him; sometimes when we lie down to sleep in the kitchen at night, the moonlight through the window catches him full-length, upside down and out to the world, his innocence almost palpable as he dreams, once again, of the seaweed which makes Kemo Sabe so annoyed. 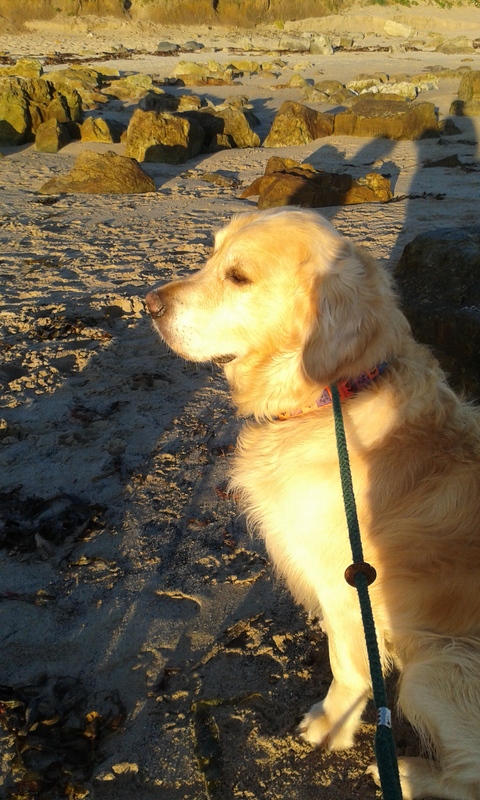 When out for walks he stares into the distance, particularly at people walking quite a way off, as if hoping they will understand the language he alone of us can speak. 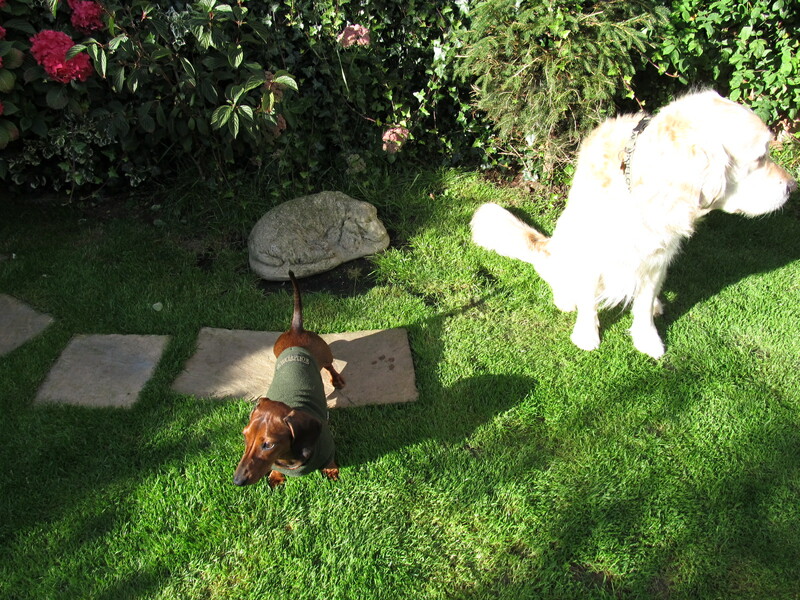 This afternoon Kemo Sabe did not understand when I refused to pose on Uncle Jonny’s grave. His spirit of great obedience and trust inspires our daily doings and I, for one, feel unworthy alongside him. Even Barnaby and Nicholas can tell they let him down. When I overcome the schadenfreude of seeing Newman reprimanded fiercely for – what amounts to – not being able to remember for very long, I think of the faults each of us would do well to eschew: if I were half as compliant as Uncle NuNu (where all but seaweed is involved), I would be a blessed spaniel indeed. As it is, for us there is only the trying (as someone famous once said) . . .